You need to carefully review the seller and item info on eBay. On the right side of an eBay listing page, you see two stacked boxes. The top box is the Seller Info box where you find valuable information about the seller. Below it is an item information box, which offers you some handy details about the listed item. Seller icons: Show the status of the seller. A varied-color star reflects the feedback level of the seller. (The color of the star changes with amount of positive feedback the seller attains.) If the seller is a Top-rated seller (which means upholding the highest standards of customer satisfaction based on the DSRs awarded by customers), you see the Top-rated seller badge. A blue and red ME icon will point you to the seller’s About Me page. Feedback score: This number is also to the right of the seller’s name in parentheses. Click the number next to the seller’s ID to view his eBay ID card and entire feedback history. Read all the feedback to make sure that you feel comfortable doing business with this person. Positive feedback percentage: The eBay computers calculate this figure. It’s derived from all the positive and negative feedback that a user receives. Ask a Question: Clicking this link hooks you up with eBay’s e-mail system so that you can ask the seller a question regarding the item. Visit seller’s other items or store: This link takes you to a page that lists all the seller’s current auctions and fixed-price sales. If the seller has an eBay store, a link to it appears here as well. 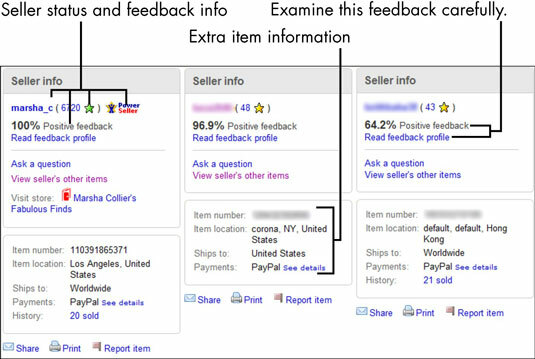 Consider a quick glance at the Seller Info box as the lightweight version of feedback investigation. A perfunctory glance at this box might be okay if you’re purchasing an item that’s worth a few dollars to you — and if the seller’s info box shows you 99 to 100 percent positive feedback. However, if the Seller Info box is not as high on positive feedback, and you’re looking at a pricier item, it’s time for a more thorough analysis. Item number. A very important number for eBay buyers and sellers. Use it to cross-reference to your PayPal transaction and, if you’re the seller, also to your eBay invoice. Item location: Tells you (at the very least) the country where the seller is located. You may also see more specific info, such as the seller’s city and geographic area. (What you see depends on how detailed the seller chooses to be.) The item location is handy if you’d like to go pick up the item. Ships to: If the seller ships to only the United States, you see that here. If the seller ships to any other countries, this is where you find them listed. Payments: See the type of payments accepted, such as PayPal. History: Tells you how many bids have been placed or how many items in a multiple price listing have sold. When the listing is live, you can click the number of bids to find out who is bidding and when bids were placed. You can click the number of bids to see how the bidding action is going, but you won’t be able to see the high bidder’s proxy bid. Share. Ever come across an item that would be perfect for a friend? Click here, and you can send them a link to the listing by e-mail. It’s also handy if you want to send the link to yourself. Print. The Print link is pretty lame. If you click it, a quasi-version of the page comes up — without the seller’s description! Report Item. Very important! Once you become familiar with eBay’s rules, you get to be part of the community, and sometimes that means helping police the site. If you feel the listing you’re viewing contains a violation in ($10 shipping for a 2-ounce item? ), you can click here to report it to eBay.